Mello-Silva, R. (2009). Neotropical Velloziaceae. Herbs and shrubs, from few centimetres (Velloziaabietina Mart., V. minima Pohl) to more than 6 meters (V. gigantea N.L.Menezes & Mello-Silva), normally from 30 cm to 2 m tall; stems sparsely branched, c. 1-2 cm diameter, covered by persistent leaf sheaths and adventitious roots and, frequently, also by old marcescent leaves so that they can reach 50 cm diam. Leaves tristichous or spirotristichous, from few centimetres to almost 1 m long, located at the branch apices; leaf sheaths developed; leaf blades deciduous by abscission line at the top of the sheath , or marcescent and reflexed with age. Inflorescences terminal , fasciculate , with one to some flowers (to 12 in Barbaceniapolyantha Goeth. 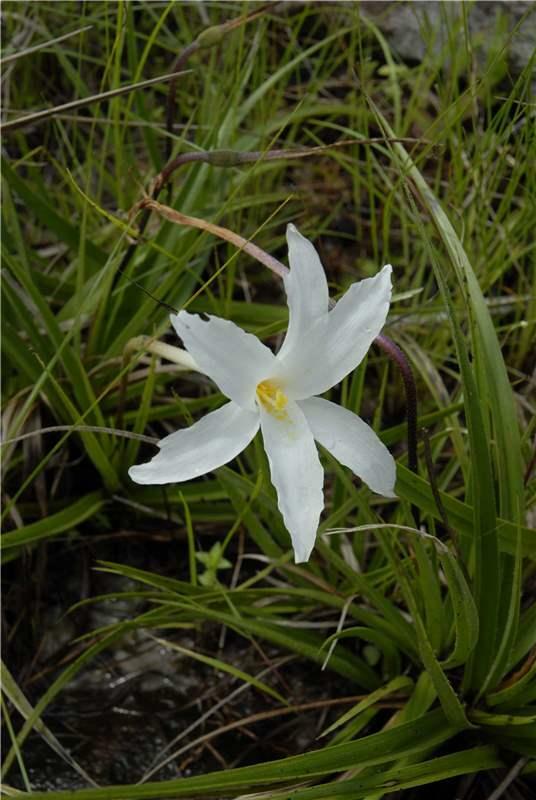 & Henrard and to 15 in Velloziatubiflora Kunth); flowers often large and showy, actinomorphic , monoclinous, rarely diclinous (Barbaceniopsis L.B.Sm. ); hypanthium normally longer than ovary , frequently elongated into a tube, smooth or with glandular or non- glandular emergences; tepals six, mostly violet, pink or sometimes white or, very rarely, yellow in Vellozia, red, orange, yellow, white, green or violet in Barbacenia Vand. or violet, white or yellow in Barbaceniopsis; corona present (Barbacenia); stamens 6 (Barbacenia and Barbaceniopsis) or 6-76 (Vellozia); filaments free (Vellozia and very few Barbacenia) or anthers attached to the corona (most Barbacenia) or to the hypanthium (some Barbacenia, Barbaceniopsis); lacerate staminal appendages often present in Vellozia; pollen in monads (Barbacenia, Barbaceniopsis, Velloziaplicata Mart. ), in tetrads (Vellozia) or in polyads (V.andina Ibisch, R.Vásquez & Nowicke); ovary inferior, usually longer than broad, rarely hemispheric, tricarpelar, trilocular, placentation axile , septal nectaries conspicuous; stigmas peltate -trilobed (Vellozia); capitate , clavate , linear or subapical (Barbacenia), or subulate (Barbaceniopsis); capsules loculicidal, poricidal or costulate; seeds small, numerous. 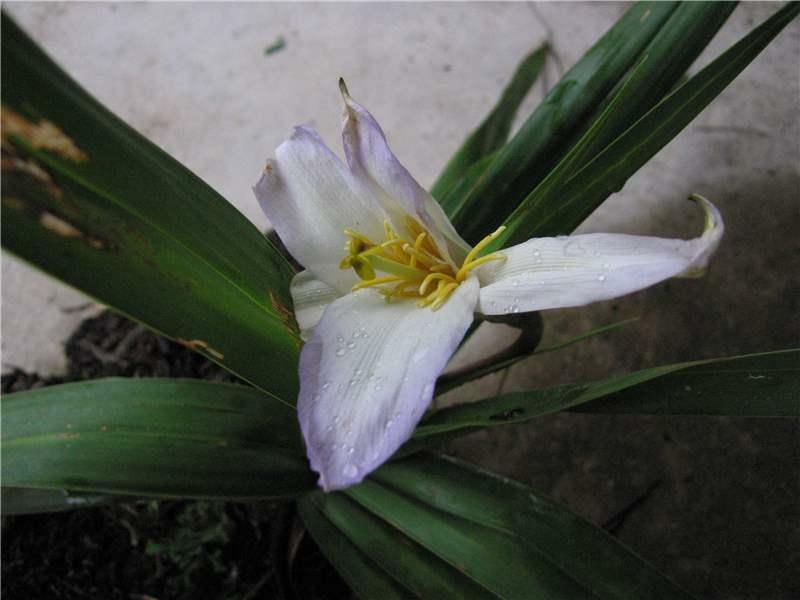 There are no problems of delimitation with the Neotropical Velloziaceae but, recently, a genus from China, Acanthochlamys P.C.Kao, has been included in the family, broadening its delimitation and distribution. 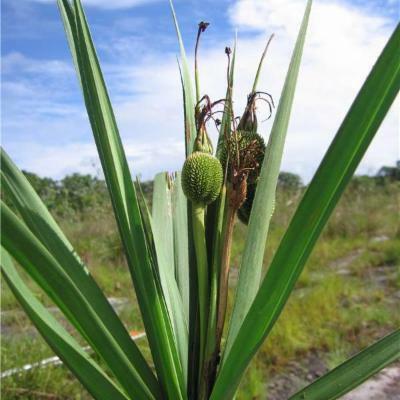 There are five other genera commonly cited among the Neotropical Velloziaceae. Aylthonia N.L.Menezes, Burlemarxia N.L.Menezes & J.Semir and Pleurostima Raf., dismembered from Barbacenia, are not monophyletic and not accepted. Nanuza L.B.Sm. & Ayensu is sister to Vellozia s.s. and has been merged into it. Xerophyta Juss. is endemic to Africa. Barbacenia: Brazil (mainly Central/Eastern), Venezuela. 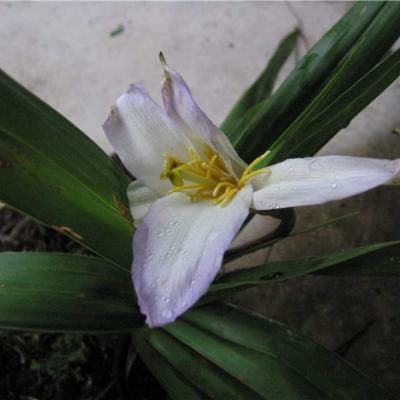 Vellozia: Bolivia, Brazil (mainly Central/Eastern), Colombia, Guyana, Venezuela, Panama. Hypanthium with glandular or non glandular emergences. Slender stem covered by adventitiousroots and either persistent leaf sheaths or entiremarcescent leaves. The Velloziaceae are quite distinct from every other family. The stem could resemble that of some Agavaceae, Dracaenaceae or Pandanaceae, but in those families it is not covered by adventitiousroots along with either persistent leaf sheaths or entiremarcescent leaves. Some Bromeliaceae and few Cyperaceae could present a stem like that of the Velloziaceae, but those families, as well as the Agavaceae, Dracaenaceae and Pandanaceae, have conspicuous inflorescences. Barbacenia: abscission line between sheath and lamina absent; flowers monoclinous; tepals mostly yellow, orange, red or greenish, rarely violet, corona present; stamens six; style longer than stigmas, stigmas vertical, fused at apex or free; pollen in monads. Barbaceniopsis: abscission line between sheath and lamina absent; flowers diclinous; tepals white, yellow or violet, corona absent; stamens six; style shorter than stigmas, stigmas vertical, fused at apex; pollen in monads. Vellozia: abscission line between sheath and lamina present or absent; flowers monoclinous; tepals almost always violet, sometimes white, very rarely yellow, corona absent; stamens sometimes six, rarely nine or 12, almost always more than 12; style longer than stigmas, stigmas horizontal, fused at center; pollen in monads (one species), in tetrads or in polyads (one species). Behnke, H.-D., Treutlein, J., Wink, M., Kramer, K., Schneider, C. & Kao, P.C. 2000. Systematics and evolution of Velloziaceae, with special reference to sieve-element plastids and rbcL sequence data. Botanical Journal of the Linnean Society 134: 93-129. Henrard, J.T. 1937. Velloziaceae americanae nonnulae novae vel minus cognitae. Blumea 2: 339-384. Ibisch, P.L., Nowick, C., Vásquez, R. & Koch, K. 2001. 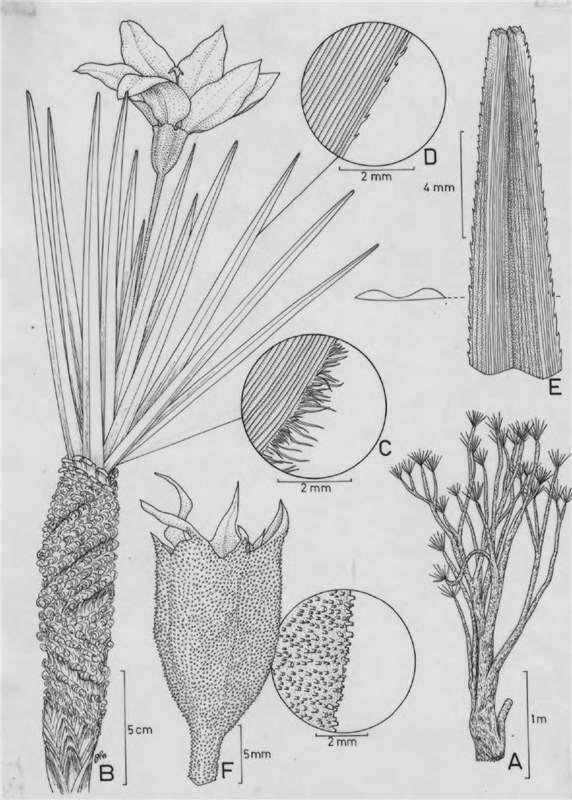 Taxonomy and biology of Andean Velloziaceae: Vellozia andina sp. nov. and notes on Barbaceniopsis (including Barbaceniopsis castillonii comb. nov.). Systematic Botany 26(1): 5-16. Kubitzki, K. 1998. Velloziaceae. In: Kubitzki, K. (ed), The families and genera of vascular plants. Flowering plants, Monocotyledons, Lilianae (except Orchidaceae). Vol. 3, pp. 459-467. Springer Verlag. Berlin. Mello-Silva, R. 1991. 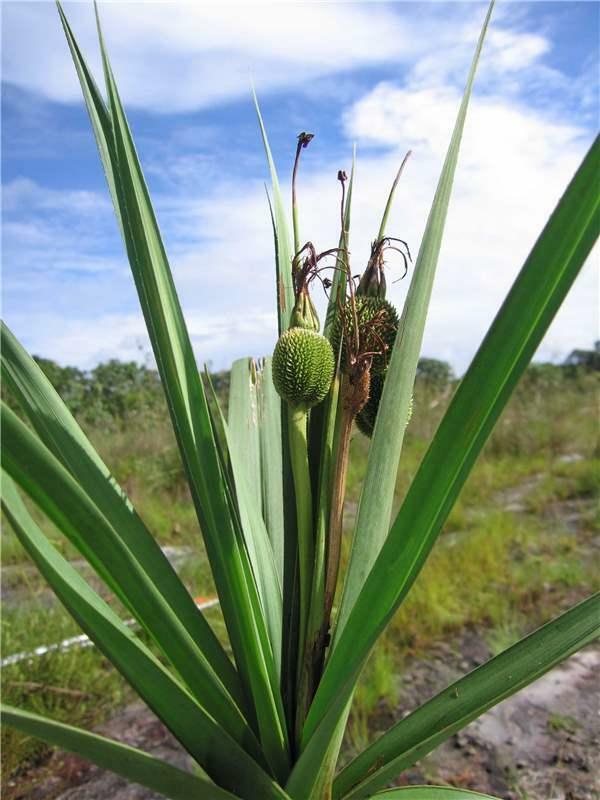 The infra-familial taxonomic circumscription of the Velloziaceae: A historical and critical analysis. Taxon 40: 45-51. Mello-Silva, R. 2004. Velloziaceae. In Smith, N., S.A. Mori, A. Henderson, D.W. Stevenson & S.V. Heald (eds. 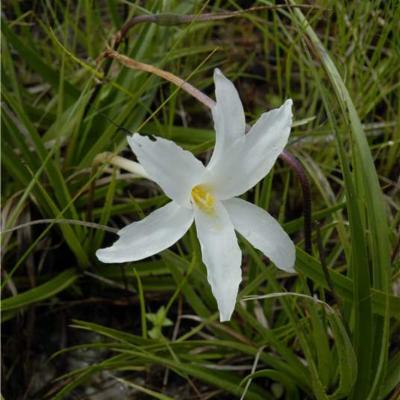 ), Flowering plants of the neotropics. Pp. 490-491. Princeton University Press. Princeton. Mello-Silva, R. 2005. Morphological analysis, phylogenies and classification in Velloziaceae. Botanical Journal of the Linnean Society 148(2): 157-173. Menezes, N.L. 1971. 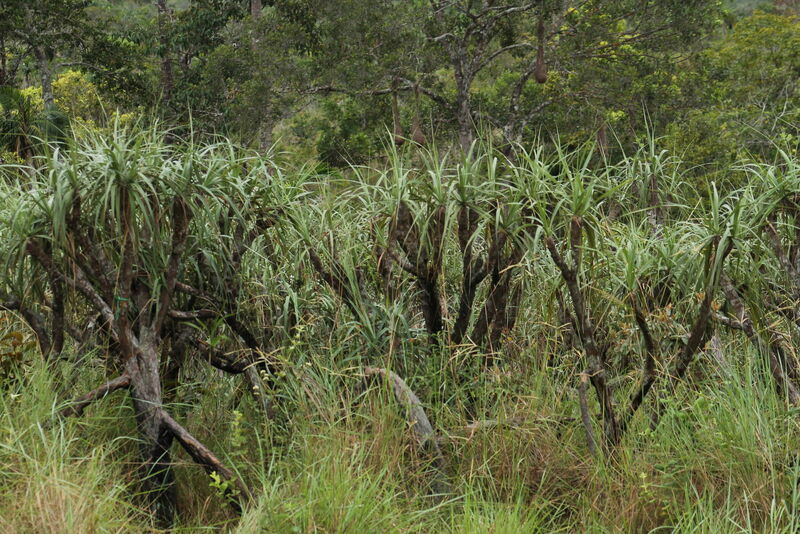 New taxa and new combination in Velloziaceae. Ciência e Cultura 23(3): 421-422. Menezes, N.L. 1980. 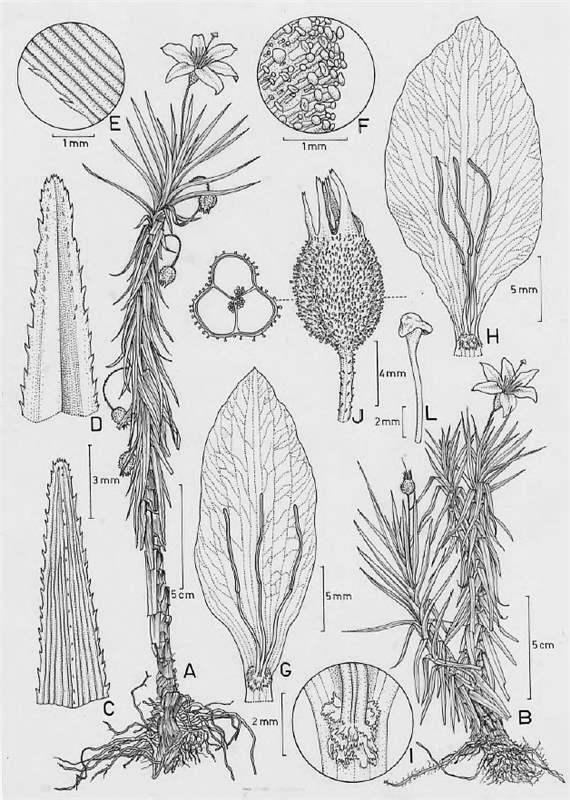 Re-establishment of genus Pleurostima Rafinesque (Velloziaceae). Revista Brasileira de Botânica 3: 37-47. Menezes, N.L., Mello-Silva, R. & Mayo, S.J. 1994. 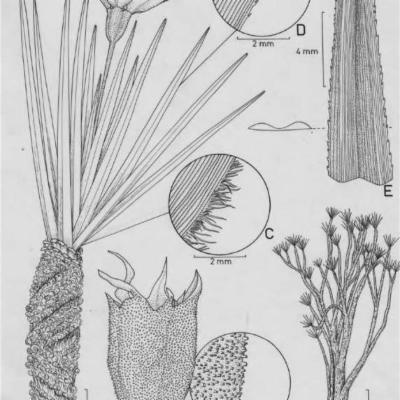 A cladistic analysis of the Velloziaceae. Kew Bulletim 49(1): 71-92. Menezes, N.L. & Semir, J. 1991. 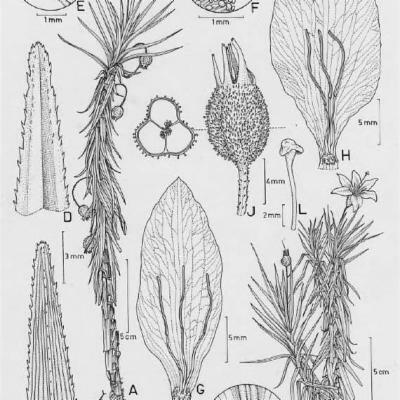 Burlemarxia, a new genus of Velloziaceae. Taxon 40: 413-426. Salatino, A., Salatino, M.L.F., Mello-Silva, R., Sluys, M.-A., Giannasi, D.E. & Price R.A. 2001. Phylogenetic inference in Velloziaceae using chloroplast trnL-F sequences. Systematic Botany 26(1): 92-103. Smith, L. B. 1962. A synopsis of the American Velloziaceae. Contributions from the United States National Herbarium 35(4): 251-292, pl. 1-12. Smith, L.B. & Ayensu, E.S. 1976. A revision of American Velloziaceae. Smithsonian Contributions to Botany 30: i-viii, 1-172.